Cucina Povera: The Great Sunday Pantry Clean-Out! The Great Sunday Pantry Clean-Out! It is a dreary Autumn day in May. The sun refuses to come out. It is too much to think about being a weather forecaster to risk doing any laundry - and the cost of electricity these days makes me wince at using the dryer. So what to do?... Cook of course! I have set myself a challenge - to try and cook from my fridge and pantry with as many ingredients on hand as possible to make as many dishes as possible. Today, I made a pretty significant dent in my 'home' produce department, without having to go to the supermarket. I made 3 dishes today without the need to buy anything other than 1 item, which was more out of want than need - a bottle of red wine! 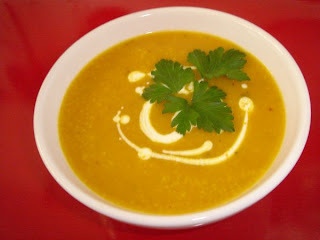 To begin with I made roasted pumpkin soup. This was so amazingly simple I hardly need to leave the recipe. If you know how to roast vegetables and use a blender, you can make this soup. Let me give you a quick run down. Put all ingredients into a roasting pan, drizzle with olive oil and roast for about 30-45 mins or until veg are nice and tender and have a nice caramelisation (I hate that word but this is what you are looking for). When done, transfer to a blender and blitz, adding water or stock to thin the puree out to your desired consistency - and to help with the blending process. Transfer to a saucepan and bring to a low simmer. If desired, you can thin the soup further with some cream. The soup will be slightly sweet from the roasting of the vegetables and the cumin and coriander seed give it a kind of lemony echo. Roasting the garlic also gives it a nice mellow sweetness. This recipe will yield just under 2 litres, depending on how thick or thin you like it and will freeze well. Next I made a beef and red wine stew to have with home made pasta (I am such a show off I know). Here is my crude attempt at a recipe for this dish! Cook the onion, garlic, carrot and celery, rosemary and bay leaf in a heavy bottomed pan with a lug of olive oil until translucent. Add the beef and cook until browned (and make sure you get some nice brown jammy bits on the bottom of the pan). Keep the heat up and add the wine, letting it boil off for about a minute to reduce a little. Add tomatoes and cook for about a minute or two (this helps get rid of the raw taste of tomato.) Add your stock and turn heat down to a low simmer and let cook for 2-3 hours, keeping an eye that the sauce doesn't catch on the bottom of the pan and burn. The stew will be cooked when the meat is falling apart and the sauce has reduced. Serve with mashed potato, polenta or your choice of pasta. I have had some dates in the freezer for a while which I had pretty much forgotten about (ants don't get inside of my freezer) and in the pantry I had a packet of Californian Walnuts. 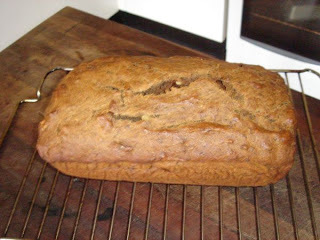 To me that just screams Date and Walnut Loaf! Preheat oven to 180°C. Grease and line a loaf pan. Place dates, water, brown sugar and butter in a saucepan. Cook over medium heat, stirring gently until the sugar dissolves. Bring to the boil, reduce heat and simmer, uncovered, for 2 minutes. Allow to cool for 20 minutes. Sift the flour, baking powder and spices into a large mixing bowl. Add the beaten eggs to the date mixture and stir well to combine. Pour the date mixture into the flour mixture and use a wooden spoon to bring the mixture together. Add the walnuts and stir until combined. So all in all it was a very productive day. I have soup for my lunch tomorrow and enough stew to freeze and keep for another time. The loaf will be a wonderful snack before bedtime and also serves as my morning tea for work tomorrow. I also have enough pasta dough to make 2 more serves of fettucine. It feels so good to be thrifty and at the same time I am eating like a Queen! You should REALLY consider self-publishing a cookbook! The Cucina Povera picture at the top of each blog would be a PERFECT cover photo for it! Who are you calling a Tart? Steamboats and my interpretation of them! You don't have to be Italian to make fresh pasta.